Like old barber shops, I love old shoe repair shops. Every time I see one that looks promisingly ancient and unchanged, I go in for a shine. 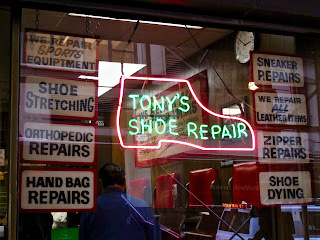 For years, every time I went by Tony's Shoe Repair on West 35th Street, the gate was down. My timing was never right. 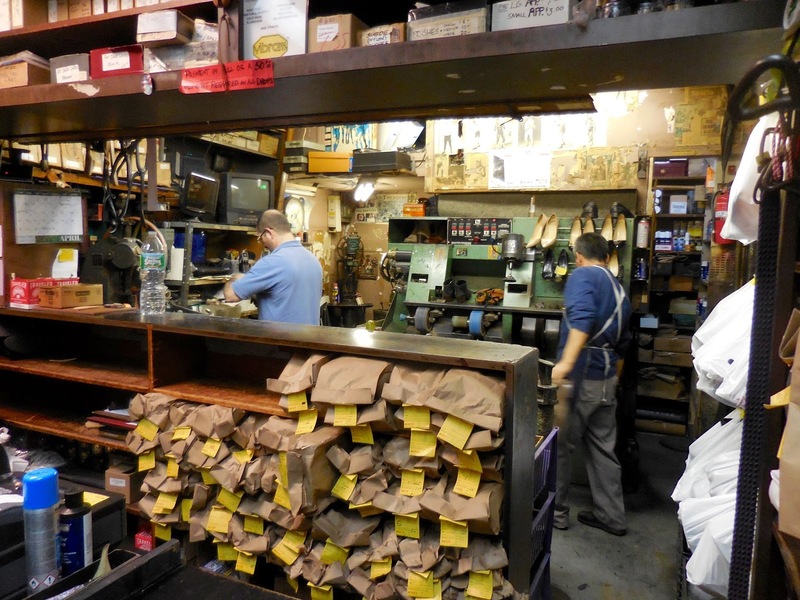 Currently run by Guy Pisani, Tony's has been around for 81 years--and then some. 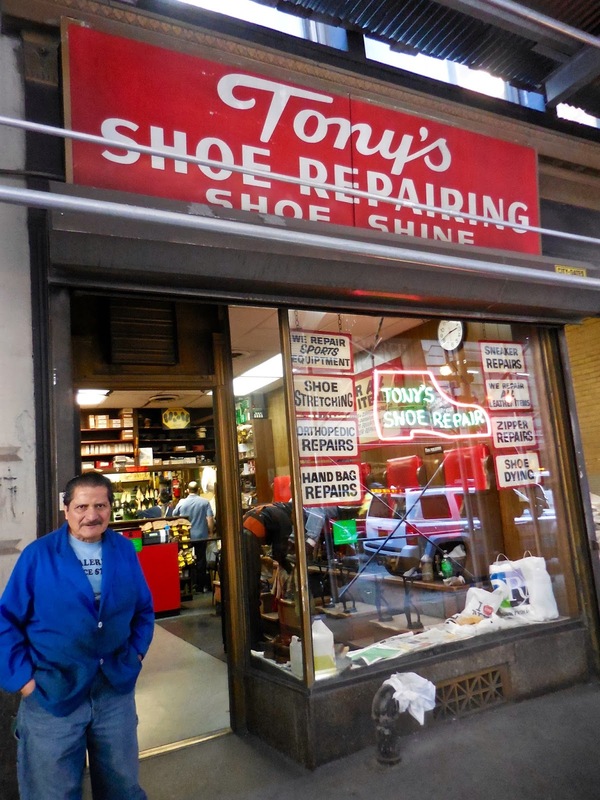 Their Facebook page reads: "Since 1934 Tony's Shoe Repair has been a family run business in the heart of the garment district on 7th Avenue in New York City. For three generations our family has faithfully served the mid-town area through thick and thin." Mitch Broder explains the lineage: "Tony is the son of Tony, who also isn’t Tony, but who is also the son of Tony, who also wasn’t Tony. 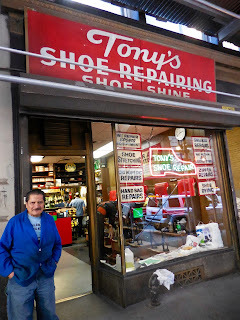 The real Tony was the guy who opened the store in 1928 and sold it six years later to another guy, named Gaetano. Gaetano kept Tony’s sign, thus becoming the second Tony and setting the stage for his son Dan and grandson Gaetano, or Guy, to become the third and fourth Tonys." It's the kind of place where the shine men chat amiably amongst themselves, old friends who have been there forever. They wear blue smocks. Their hands are stained with polish. 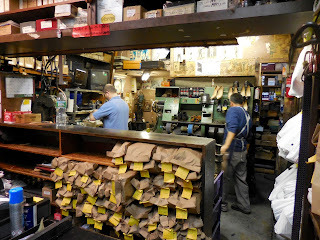 The man who shined my shoes offered not brown polish, but cordovan. "Yeah, that's definitely cordovan." He pronounced the syllables individually, each with equal emphasis: COR-DO-VAN. Just hearing the word was a pleasure. And then he said it again, for good measure. 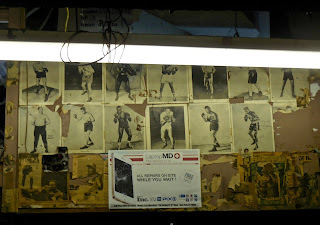 The interior decor, the signage, all recalls the old New York, unfussy and unfixed up, weathered and real. Perfect. 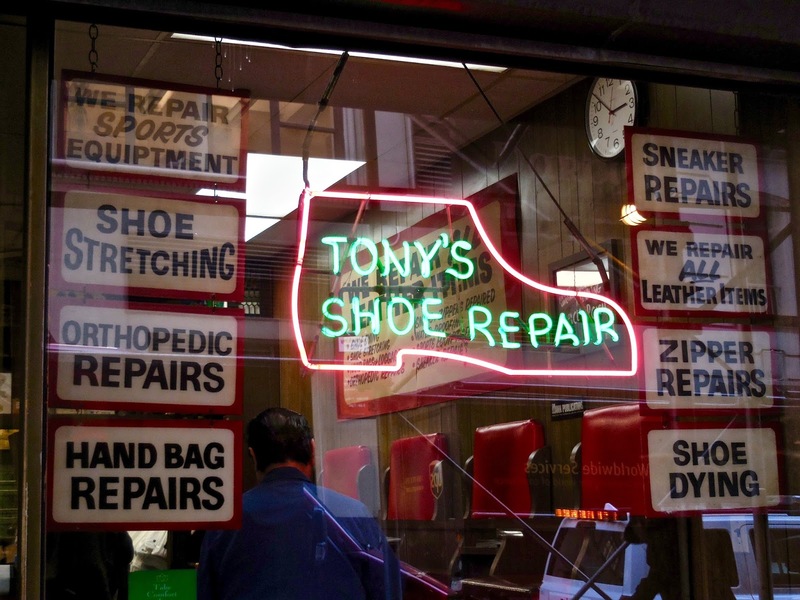 One sign in the window advertises SHOE DYING, a poignant misspelling. The place hasn't been redecorated since 1966. On a back wall, photos of forgotten boxers peel away, souvenirs from nearby Madison Square Garden. Otherwise, the chairs are red. The walls are paneled. And the shine is good. 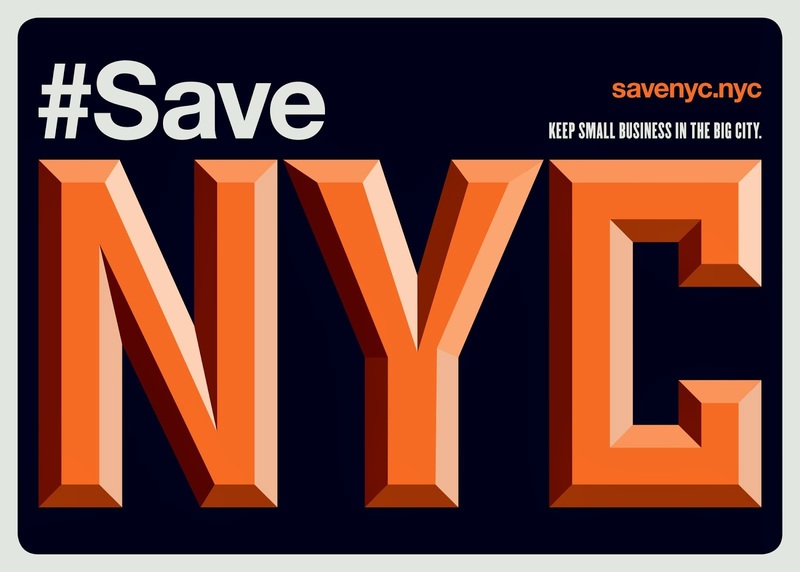 Everything is being replaced by exorbitant-priced apartment units, expensive bars, coffee shops and restaurants. Nothing of practical value is being replaced: supermarkets, laundromats, barber shops, hardware stores and the like. Yet those uppity civilian aristocrats who roam around and patronize all those expensive places always manage to look so well-groomed and polished and so well-dressed. How do they maintain their "good looks" and where do they find all their nice clothes? And how are they able to keep their outfits so nice and clean and pressed if all the dry cleaning businesses are no longer around after having been displaced to make room for all these fancy establishments that now stand in their place? Are all services performed by outfits found online somewhere? They always did a great job on my shoes and boots. Very nice people. Thanks for posting about them.